As I continue to blog twice a week, I realize that no matter what I write, it will mostly go unread in the second half of this week due to the Thanksgiving holiday, so I thought I would just wish everyone a happy, healthy Thanksgiving filled with friends, family and lots of food! And let’s not forget the leftovers the next day. 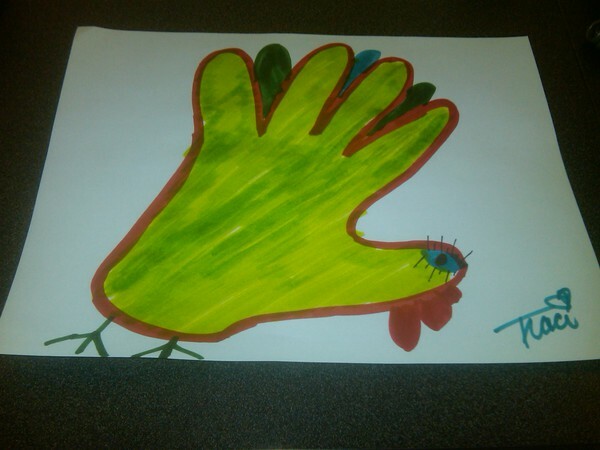 I was planning to draw a hand turkey to accompany my Thanksgiving wishes, but I saw my friend Traci’s hand turkey and felt there was nothing I could do that would outshine her day glo hand turkey, so I’m displaying hers, with her permission.